Thomas Cranmer (July 2, 1489 – March 21, 1556) was the Archbishop of Canterbury during the reigns of the English kings Henry VIII and Edward VI. He is credited with writing and compiling the first two Books of Common Prayer, which established the basic structure of Anglican liturgy for centuries and influenced the English language through its phrases and quotations. He was one of the first Anglican martyrs; burned in 1556 for heresy. He is commemorated by the Church of England on March 21. While the English Reformation was mainly driven by political considerations—not least of all the King's desire to obtain a divorce—Cranmer's support for Henry's break with Rome was theologically motivated. He led the newly independent church towards a reformist and Protestant self-understanding that resembled Luther's, that drew on Calvinism but which cannot be wholly identified with either. While his name as a reformer is less well known than Martin Luther's or John Calvin's, Cranmer deserves to be regarded as the father of English Protestantism. The Anglican Church's main strength would be inclusiveness, which represents a significant contribution to Christianity. Cranmer's detailed work on a statement of faith for the Church of England remains the official basis of Anglican doctrine. Cranmer was born in 1489 in Aslacton, now Aslockton, near Nottingham. His parents Thomas and Agnes Cranmer were from the lesser gentry and had only enough wealth and land to support their eldest son upon their death. Due to this lack of land, the scholarly Thomas and his younger brother joined the church. This was a tradition at the time, with military service or the priesthood as the usual career for younger sons. In 1510, he was given a fellowship at Jesus College, Cambridge. In 1515, while still at Cambridge he married Joan, the niece of the landlady of the nearby Dolphin Tavern; this led to his expulsion from the college due to the rule that fellows were to remain celibate. This early marriage suggests that Thomas had an academic rather than a priestly career in mind as, while married, he lectured at what later became Magdalene College. In 1519, Joan Cranmer died during childbirth; this allowed him to be re-accepted into the college. He was known as a dedicated student and was noted for his interest in unorthodox philosophy. Cranmer became a doctor of divinity in 1523 and ordained the same year. He was both a lecturer in divinity at Jesus College and public examiner in divinity to the university. He rejected several candidates on the grounds that they did not have sufficient knowledge of the Bible, evidence that Cranmer's own concern for Biblical teaching was already forming. In August 1529 an outbreak of the plague forced Cranmer to leave Cambridge for the safety of Essex, accompanied by two of his students. They stayed at the home of one of the students. Coincidentally, King Henry VIII was visiting the county at the time and two of his counselors were staying at the same house. In conversation with Cranmer, the subject of the king's desire to obtain a divorce from Catherine of Aragon was raised and when Cranmer expressed the view that as Catherine had previously been married to the king's brother, the marriage was probably illegal. The counselors decided to bring his opinion to the king's attention. Cranmer suggested that if the two Universities (Oxford and Cambridge) were to agree on this issue, that a petition to this effect sent to Rome might result in an annulment. Cranmer was employed to compile a written treatise and plan of action, and accommodated in the home of Ann Boleyn's father while he worked on this commission. The result was the Collectanea Satis Copiosa (the “sufficiently abundant collection”) in 1530, giving legal and historical precedent of cases such as Henry's, allowing the king to build an academic case to break with Rome. Cranmer was then sent as part of the embassy to Rome in 1530, and in 1532 he became ambassador, with the title Consiliarius Regius et ad Caesarem (“Orator to the Holy Roman Emperor”) Charles V. He was also asked to explore possible alliance between England and the Lutheran princes, as well as trade concessions. Consequently, he met Andreas Osiander (1498-1552), the mystically-inclined colleague of Luther, and a Protestant theologian in his own right. Both Osiander and Cranmer were convinced that the church had to change, although neither was entirely clear on what the right direction was. Cranmer married Osiander's niece, Margarete in 1532, suggesting that he no longer believed in clerical celibacy. That year, he also accompanied the emperor in a battle against the Turks, forcing them back from a large area of Hungary. Stained glass window depicting martyrdom of Archbishop Cranmer and others - Christ Church (Episcopal), Little Rock, Arkansas, U.S.A.
By January 1533 Henry found out that Anne Boleyn, the woman he wanted as his wife, was pregnant. This added urgency to the matter of the king's annulment and they were married in secret by the end of the month. 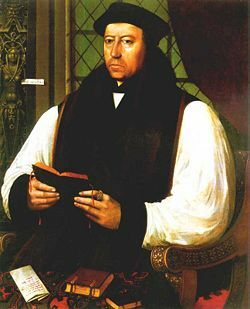 On March 30, 1533, Cranmer was appointed Archbishop of Canterbury after the death of William Warham. Cranmer appears not to have especially wanted this position, for which his marriage disqualified him. Cranmer, however, was Henry's choice because he believed that he would support his policies and find solutions to his problems. This appointment by Henry, despite the consent of the Pope, shows that he had given up the hope of getting consent for an annulment from Rome. Cranmer brought his German wife Margarete with him when he became Archbishop but kept her presence quiet so as not to be seen breaking the rules on clerical celibacy. When he was installed as Archbishop, he unusually recorded a written objection to the oath of allegiance to the Pope as well as to the king, stating that he considered loyalty to the king to be his supreme duty. This could suggest that he was already questioning papal supremacy. Certainly, there is cause to suspect that Cranmer already identified himself with the reformers. In May, Cranmer declared the marriage of Henry to Catherine of Aragon void and Anne Boleyn his lawful wife. In doing this, Cranmer went directly against the Pope's command. However, he did not do this lightly but first convened a convocation during the whole month of April, at which the issue was discussed. Catherine was disallowed a right to appeal. In September, Anne gave birth to Henry's second daughter Princess Elizabeth. Cranmer was the godfather. Henry's marriage was de facto a break with Rome. From 1525, the German princes claimed the right to determine which church they would follow, and Henry now asserted the same privilege. He declared himself Supreme Governor of the Church of England. Henry had little personal inclination towards Protestantism, but for better or for worse he had identified the independent church with the reformist movement. However, while the Lutheran church in Germany represented a new ecclesiastical organization, with a different structure from the Catholic Church; in England the episcopacy and parish system remain in place. Worship remained liturgical and sober, not “enthusiastic” and unscripted as some Protestants preferred. Cranmer himself saw it as a “middle way” (via media) (MacCulloch, 617) although not so much in the sense of its more recent usage. Rather, Cranmer wanted to build up the Catholic Church anew on the same foundation of the Bible, creeds and the great councils of the early church, while some reformers wanted to replace creeds and tradition with the Bible. Thus, the Church of England continued to claim continuity with the apostolic succession (although there would be a break during Mary I of England Mary's reign. However, clergy could marry and religious orders were dissolved, with much of the wealth being used to create six new diocese. More recent use of the term “middle way” refers to “walking between two extremes, and hospitably and sympathetically listening out in either direction for good ideas,” that is, towards the Catholic and Protestant ends of the church. Not everyone liked Cranmer’s ideas and several bishops conspired to have him removed. He himself later forgave them; and “it illustrates a favorable trait in the archbishop's character that he forgave all the conspirators” (Pollard, 337). Under Henry, Cranmer was able to push through the reforms that led gradually to the reform of the Church of England. He may have been reluctant to accept the Primacy but once he did he used his position to steer the English reformation. This included writing the 10 Articles, which stated the reforms but also showed a politeness that Cranmer possessed because he didn't want to offend anyone. For example he didn't say that transubstantiation was incorrect, but that there was a possibility that it might be. This desire to include rather than exclude would be characteristic of the Anglican tradition. The reforms affirmed the centrality of scripture and justification by faith and moved away from a sacrificial understanding of the mass, thus clerical dress and the liturgy were simplified. The vernacular was introduced, just as in Germany. Cranmer ordered that a copy of the English bible be displayed prominently in all churches. Pollard (1911) describes this as the “most important feature” of the reformation in England, that is, “the endeavor to promote the circulation of the Bible in the vernacular” (376). Cranmer also opposed Henry VIII's Six Articles, which reaffirmed clerical celibacy. Clerical marriage was an important Protestant principle. Henry's ambivalence here suggests that his Protestantism was more pragmatic than theological. At the time of the Dissolution of the Monasteries, Cranmer was given various former church properties, such as the former Cluniac Nunnery at Arthington Priory. In 1536 Cranmer was compelled by circumstance to declare Henry's marriage to Anne invalid, on the grounds that the king had had an affair with her sister. Cranmer, though, condemned the House of Lords’ decision to execute Anne, pleading for her life. He was also involved in the dissolution of the king's marriages to Anne of Cleaves and in Catherine of Howard's execution for treason (being aware of her infidelity). There is little doubt that Cranmer was compromised in his dealings with the king's marriages. Cranmer greatly admired Henry and on his death declared he would not shave his beard again as a sign of mourning. On Henry's death in 1547, Cranmer became an indispensable advisor to his son and successor, Edward VI, who, as a child, had been brought up with Protestant views. Cranmer also encouraged the destruction of images. He described these latter activities as “jolly musters.” Clerical dress would be white surplus and black stole. Other vestments, such as a chasuble, associated with the sacrificial mass, were banned. Concerned about the need for good preaching and the lack of literate clergy he compiled and wrote the first Book of Homilies, as well as the Forty-Two Articles that summarize Anglican doctrine. These, in general, led the Church of England in a more Protestant direction. The 39 Articles, which were based on the 42 Articles and adopted during the reign of Elizabeth I, are still recognized as part of the Anglican heritage to which clergy in some of the national churches in the Anglican Communion vow to support. They include the doctrines of Trinity (1), the “sufficiency of the scriptures for salvation” (VI), of good works as the fruit of salvation, not as the means of salvation (XII) that the Church of Rome has “erred” (XIX) and the spiritual nature of Christ's presence in the Eucharist, which is of two kinds (bread and wine) (XXVIII). Nor should the bread and wine be “carried about” or “gazed upon.” Cranmer appears to have subscribed to Calvin's view of a spiritual, rather than a physical, presence (real presence) during the Eucharist. However, he regarded the bread and wine as more than mere symbols (Pollard, 377). He also seems closer to Calvin than to Luther on the concept of sanctification, of works being the fruit of justification (MacCulloch, 342) and on predestination. Thus, “baptism was only a means of regeneration for those who were already elect” (428). Cranmer upheld the view that God has preordained who will be saved, although MacCulloch thinks that Calvin's influence should not be overstressed, Calvin “…was respected by his English counterparts, but [he was not] “not in any sense central to their thinking” (428). In 1548 the Homilies were published, outlining correct doctrine, In 1548 Cranmer's translation of the catechism of Justus Jonas (1493-1555), a colleague of Luther, appeared. In 1550 he wrote Defense of the True and Catholic Doctrine of the Sacrament. Sometimes Cranmer's language resembles Calvin's more than Luther's but the 1552 Book of Common Prayer was explicit in affirming Baptism and Christ's sacrificial death as universally efficacious, which was Luther's view. Cranmer really had hoped to forge a united church that could embrace as many as possible, pleasing with his fellow reformers that they “allow a concord to appear and knit together” so that the Churches would attract “the peace of God which passes all understanding.” Thus, “if only [they] could agree among themselves, and unite together in some holy confederacy [they might] easily convert even the Turks to the obedience of our Gospel” (181). Edward VI died in 1553, to be succeeded by his half-sister, Mary I. Mary was the daughter of Henry’s first wife (Catherine of Aragon), a Spanish princess, and was brought up in the Roman Catholic faith. In line with her Catholic beliefs, she began the process of counter-reformation. She declared that England was now Catholic. Cranmer was summoned to Rome. He could not go, since Mary had confined him in Oxford Prison, but he was declared a heretic, excommunicated and removed from office as archbishop. He, says Pollard, “set practically no limits on the ecclesiastical authority of kings; they were as fully representative of the church as the state” (377). On February 14, 1556, Cranmer, as a Protestant, was removed from office, imprisoned and charged with treason. The immediate cause of his arrest was a pamphlet he had just published condemning the Mass, which had been re-introduced at Canterbury Cathedral. Cramner knew that Mary's accession would result in his imprisonment but he “refused to follow the advice of his friends” to flee to the continent (Pollard, 377). Cranmer had, after all, been responsible for the removal of Mary’s mother Catherine of Aragon. Queen Mary “could not forgive his share in her mother's divorce and her own disgrace” (Pollard). He was tried and sentenced, but the queen spared his life. However, he was subsequently tried for heresy and, being found guilty, made several recantations, as he said later, in order to avoid execution. 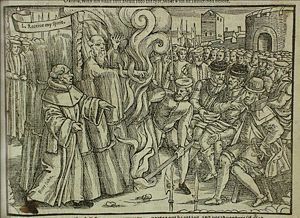 Despite this, which should have absolved him under Mary’s own Heresy Act of 1554, Cranmer was sentenced to death by burning. Mary had previously spared him and he had been reluctant to accede to the determination of Northumberland, Edward’s advisor to have Lady Jane Grey made queen in her stead although he eventually agreed to the proclamation. Cranmer signed a confession. In doing so, he initially followed his own conscience, since he believed that the Sovereign had the right to choose the national faith, which Mary had done in favor of Catholicism. This made his own Protestant position untenable. Later, however, he changed his mind, and recanted as he realized that by admitting that he was in error, he was also repudiating all his convictions and his entire career. According to John Foxe, on March 21, 1556, Cranmer was brought in procession to St. Mary’s Church in Oxford where he was to make a public statement affirming his recantation. Instead, Cranmer withdrew his recantation and denounced Catholic doctrine and the Pope from the pulpit, reportedly stating, "And as for the Pope, I refuse him, as Christ's enemy and Antichrist, with all his false doctrine." After this Cranmer was taken to be burned at the stake. He is said to have thrust his hand into the fire first, so that the hand that had falsely confessed would perish before the rest of his body. Bishops Nicholas Ridley and Hugh Latimer had earlier been burned at this place on October 16, 1555. These three martyrdoms in Oxford are commemorated with the Victorian Martyrs' Memorial. Cranmer's legacy is the worldwide Anglican Communion. The doctrines he developed remain, essentially, the teaching of the church; his Book of Common Prayer still informs and shapes its liturgy, and the middle way that he pioneered, although differently interpreted, remains for many the Church's greatest strength. Indeed, the modern Church of England contains both Anglo-Catholics or High Church Anglicans and Evangelical Anglicans, in addition to the Broad Church position and practice mid-way between them. It has been said that the popularity of his prayer book helped to shape English as an international language, and that his own literary contribution has had an enduring impact on spoken and written English. He almost certainly compromised himself on the issue of the king's marriages but in the end compensated for this survival-tactic by paying the ultimate price for his convictions. Cranmer's emphasis on making the Bible accessible in English, and on Bible teaching, made it possible for people to study the Scriptures for themselves, without the mediation of priests or of scholars. This opened up the possibility of popular piety and devotion. His Prayer Book made the liturgy both beautiful and common, so much so that the services of the Church of England became entwined with the English way of life itself. He inculturated Christianity in a way that would endure, so that even in modern, secular Britain, phrases originally from the prayer book are widely used. It has been suggested that Cranmer’s weakness was his ability to see both sides of any question (Pollard 1911), but this can also be considered a strength. Some say that he bent too easily to the king's will. On the other hand, it was because of his relationship with the king that he was able to steer the reformation. Pollard, Albert Frederick. “Cranmer, Thomas” 375-377, The Encyclopedia Brittanica Volume VII. New York: Encyclopedia Britannica, Inc. 1911 (public domain). All links retrieved July 4, 2013. This page was last modified on 4 July 2013, at 20:11.